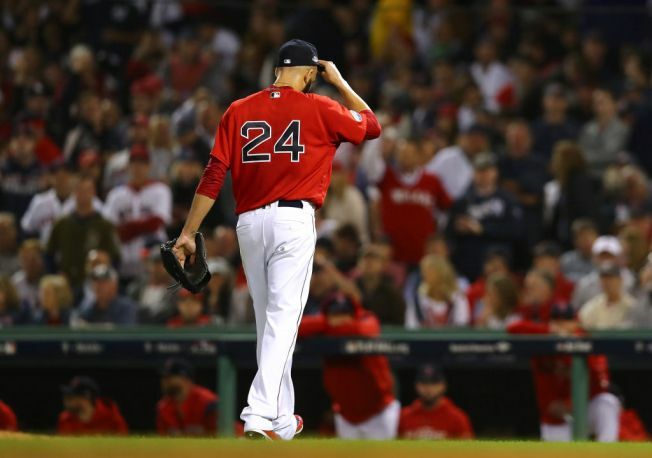 The Red Sox fell victim to the Yankees power hitters and lost 6-2 in game two of the American League Division Series Saturday night at Fenway Park. Red Sox starting pitcher David Price gave up a long home run to Yankees slugger Aaron Judge in the first inning to put New York on top 1-0. Gary Sanchez rocked Price with another solo shot in the second inning to make it 2-0. Price walked two batters before Andrew McCutchen slammed a double off the Green Monster knocking in a run, making it 3-0. With Judge the next batter and runners in scoring position, Price was removed from the game as many of the Fenway faithful booed the lefty on his walk to the dugout. He exited after 1 2/3 innings pitched. Price entered the game with a postseason record as a starter of 0-8 with a 5.84 ERA. How will the Red Sox-Yankees series end? Yankees pitcher Masahiro Tanaka held the Red Sox scoreless through three innings, keeping them off balance with his splitter, but Xander Bogaerts led off the fourth inning with a home run to center field to cut the Yankees lead to 3-1. Tanaka gave way to the Yankees bullpen after completing five innings. After Price's early exit, Red Sox relievers Joe Kelly, Ryan Brasier, and Brandon Workman kept the score to 3-1 through the sixth. Eduardo Rodriguez started the seventh and was shaky, ultimately giving up a three-run blast to Sanchez for his second homer of the game. Sanchez knocked this ball entirely out of Fenway Park onto Lansdowne St. to put the Yankees up 6-1. The game broadcast estimated the ball was hit 479 feet. The series is tied 1-1 and resumes in New York for game three on Monday at 7:40 p.m.